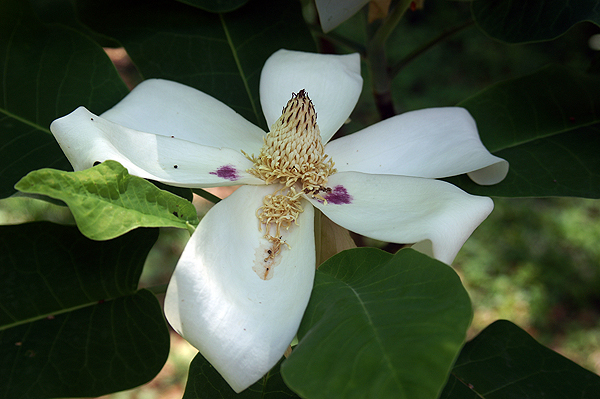 The Ash Magnolia, Magnolia Asheii, is a small rare tree species that can be found in the ravine systems in the Florida Panhandle. Although, it is not a large tree, the leaves and flower are huge. The leaves can be two feet long. The flowers can be over a foot across. This entry was posted on Saturday, September 1st, 2012 at 3:06 am. It is filed under Nature, New Images and tagged with Ash Magnolia, blossom, flower, Magnolia asheii, purple, tree, white. You can follow any responses to this entry through the RSS 2.0 feed.